With all the extra spring rainfall we've experienced this year, you may be seeing fungal diseases crop up in your lawn. If you notice black mold in your St. Augustine lawn, there could be several issues going on. Over-watering, especially in the evening or night, is often the cause of fungal diseases in the lawn, especially if the weather has also been rainy and warm. Using the wrong fertilizer can also contribute to the problem: Fertilizers too high or too low in Nitrogen can aid fungal growth. 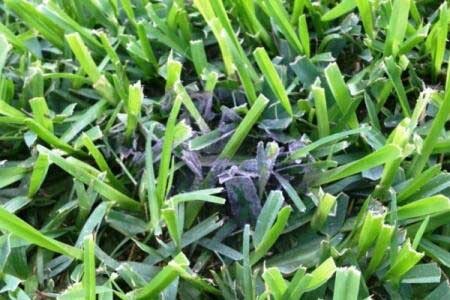 The best approach to fungal diseases in the lawn is prevention. Proper soil care, watering and fertilization can help prevent disease. Be sure to water your lawns in the morning instead of over-night. Sooty mold can sometimes be present in lawns if the surrounding trees, especially Pecans, have an outbreak of aphids. The honeydew produced by the aphids drops onto the grass allowing Sooty Mold to grow. If you notice mold or what appears to be fungal disease in your lawn, please give us a call and we'll schedule a consultation. We can identify the disease and also scout for aphid outbreaks or other pest issues. Our organic Soil Building Program ensures both your soil and your lawn are properly fed for optimal health and beauty. 972.272.921 or CONTACT US online.